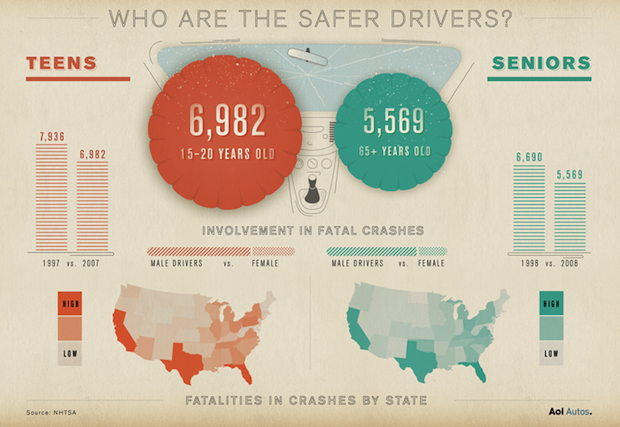 Infographic of the Day: Who Drives Worse, Teens or Seniors? What’s particularly surprising is that even in old age, males tend to get into far more car crashes that females. Morever, I bet that if you tweaked the data range on the senior set just slightly–examining, for example, those aged 68+–you’d find that they’d be at least, if not more dangerous on the road than teens. Funny that there seems to be far more attention given to how dangerous teens are on the road. Then again, teens don’t vote. And old people definitely do. Only a very dumb politician would make getting them off the road into a crusade.